I am a postdoctoral researcher for NCSA at the University of Illinois at Urbana-Champaign. 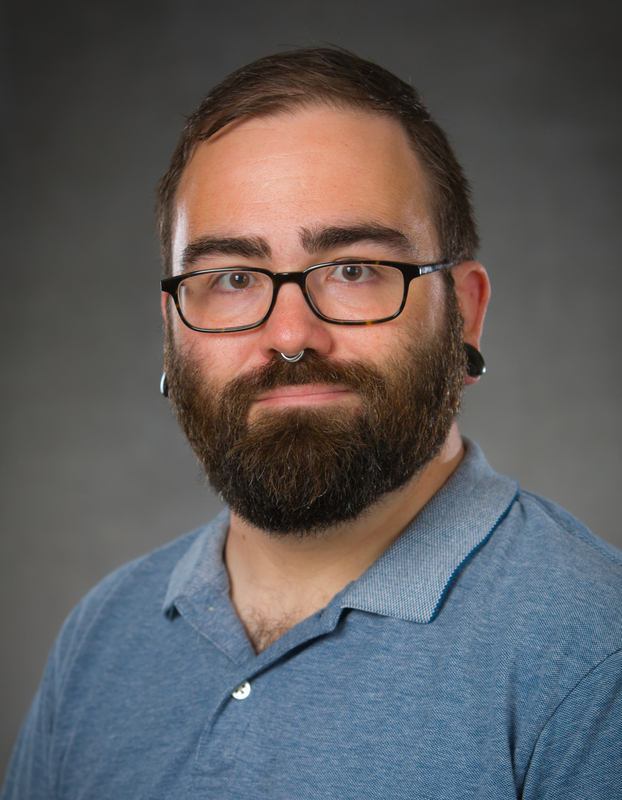 My research focuses on the development and application of software to study whole organisms at the single cell level using stochastic, spatially resolved computer simulations. I am a lead developer of Lattice Microbes a GPU accelerated simulation code which includes highly efficient methods to sample trajectories from the solution to both the chemical master equation, as well as the reaction–diffusion master equation. I am most interested in building detailed kinetic models of cellular processes which approach the genome scale. Currently, I am working on GPU-based hybrid methods combining RDME simulations with other modalities to span the many length/time/concentration scales governing the dynamics of living cells. Bianchi D, Peterson J, Earnest T, Hallock M, Luthey-Schulten Z, “A Hybrid CME–ODE Method for Efficient Simulation of the Galactose Switch in Yeast,” IET Syst. Biol. (2017), doi:10.1049/iet-syb.2017.0070, In press. It is well known that stochasticity in gene expression is an important source of noise that can have profound effects on the fate of a living cell. The most dramatic cases occur with genetic switches that can drive a population into two or more distinct phenotypes in a non-deterministic manner. In the galactose genetic switch, the unbinding of a transcription repressor is induced by high concentrations of sugar particles activating gene expression of sugar transporters. This response, which is amplified through feedback loops within the cell, results in high propensity for all reactions involving interactions with the metabolite. The reactions for gene expression, feedback loops, and transport are typically described in terms of Chemical Master Equations (CME). Sampling the CME using the Stochastic Simulation Algorithm (SSA) results in large computational costs as each event is evaluated explicitly. To improve the computational efficiency of cell simulations involving such genetic switches and other high particle number systems, we have implemented a hybrid stochastic–deterministic (CME–ODE) method into our GPU-based Lattice Microbes (LM) software suite and its Python Interface pyLM which are both publicly available LM and pyLM provide a convenient way to simulate complex cellular systems and interface with high-performance RDME/CME/ODE solvers. As a test of our implementation, we apply the hybrid CME/ODE method to the galactose switch in Saccharomyces cerevisiae and investigate the appropriate communication time between the ODE and CME solvers at various concentrations. Our robust hybrid implementation is 50–100X faster, while yielding protein distributions and species traces similar to the exact SSA CME. Earnest TM, Cole JA, Luthey-Schulten Z, “Simulating Biological Processes: Stochastic Physics from Whole Cells to Colonies,” Rep. Prog. Phys. (2018), doi:10.1088/1361-6633/aaae2c, In press. The last few decades have revealed the living cell to be a crowded spatially heterogeneous space teeming with biomolecules whose concentrations and activities are governed by intrinsically random forces. It is from this randomness, however, that a vast array of precisely timed and intricately coordinated biological functions emerge that give rise to the complex forms and behaviors we see in the biosphere around us. This seemingly paradoxical nature of life has drawn the interest of an increasing number of physicists, and recent years have seen stochastic modeling grow into a major subdiscipline within biological physics. Here we review some of the major advances that have shaped our understanding of stochasticity in biology. We begin with some historical context, outlining a string of important experimental results that motivated the development of stochastic modeling. We then embark upon a fairly rigorous treatment of the simulation methods that are currently available for the treatment of stochastic biological models, with an eye toward comparing and contrasting their realms of applicability, and the care that must be taken when parameterizing them. Following that, we describe how stochasticity impacts several key biological functions, including transcription, translation, ribosome biogenesis, chromosome replication, and metabolism, before considering how the functions may be coupled into a comprehensive model of a “minimal cell.” Finally, we close with our expectation for the future of the field, focusing on how mesoscopic stochastic methods may be augmented with atomic-scale molecular modeling approaches in order to understand life across a range of length and time scales. Earnest TM, Watanabe R, Stone JE, Mahamid J, Baumeister W, Villa E, Luthey-Schulten Z, “Challenges of Integrating Stochastic Dynamics and Cryo-Electron Tomograms in Whole-Cell Simulations ,” J. Phys. Chem. B 121(15):3871–3881 (2017), doi:10.1021/acs.jpcb.7b00672. Cryo-electron tomography (cryo-ET) has rapidly emerged as a powerful tool to investigate the internal, three-dimensional spatial organization of the cell. 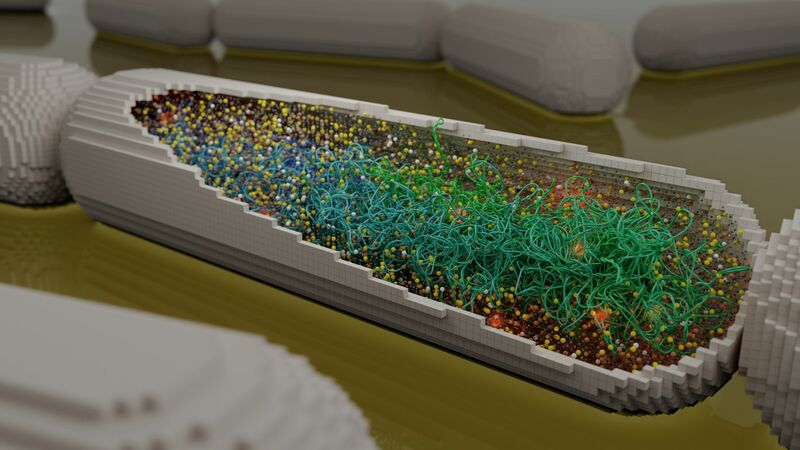 In parallel, the GPU-based technology to perform spatially resolved stochastic simulations of whole cells has arisen, allowing the simulation of complex biochemical networks over cell cycle time scales using data taken from -omics, single molecule experiments, and in vitro kinetics. By using real cell geometry derived from cryo-ET data, we have the opportunity to imbue these highly detailed structural data—frozen in time—with realistic biochemical dynamics and investigate how cell structure affects the behavior of the embedded chemical reaction network. Here we present two examples to illustrate the challenges and techniques involved in integrating structural data into stochastic simulations. First, a tomographic reconstruction of Saccharomyces cerevisiae is used to construct the geometry of an entire cell through which a simple stochastic model of an inducible genetic switch is studied. Second, a tomogram of the nuclear periphery in a HeLa cell is converted directly to the simulation geometry through which we study the effects of cellular substructure on the stochastic dynamics of gene repression. These simple chemical models allow us to illustrate how to build whole-cell simulations using cryo-ET derived geometry and the challenges involved in such a process. Earnest TM, Cole JA, Peterson JR, Hallock MJ, Kuhlman TE, Luthey-Schulten Z, “Ribosome biogenesis in replicating cells: integration of experiment and theory,” Biopolymers 105(10):735–751 (2016), doi:10.1002/bip.22892. Ribosomes—the primary macromolecular machines responsible for translating the genetic code into proteins—are complexes of precisely folded RNA and proteins. The ways in which their production and assembly are managed by the living cell is of deep biological importance. Here we extend a recent spatially resolved whole-cell model of ribosome biogenesis in a fixed volume [Earnest et al., Biophys J 2015, 109, 1117–1135] to include the effects of growth, DNA replication, and cell division. All biological processes are described in terms of reaction-diffusion master equations and solved stochastically using the Lattice Microbes simulation software. In order to determine the replication parameters, we construct and analyze a series of Escherichia coli strains with fluorescently labeled genes distributed evenly throughout their chromosomes. By measuring these cells’ lengths and number of gene copies at the single-cell level, we could fit a statistical model of the initiation and duration of chromosome replication. We found that for our slow-growing (120 min doubling time) E. coli cells, replication was initiated 42 min into the cell cycle and completed after an additional 42 min. While simulations of the biogenesis model produce the correct ribosome and mRNA counts over the cell cycle, the kinetic parameters for transcription and degradation are lower than anticipated from a recent analytical time dependent model of in vivo mRNA production. Describing expression in terms of a simple chemical master equation, we show that the discrepancies are due to the lack of nonribosomal genes in the extended biogenesis model which effects the competition of mRNA for ribosome binding, and suggest corrections to parameters to be used in the whole-cell model when modeling expression of the entire transcriptome. Earnest TM, Lai J, Chen K, Hallock MJ, Williamson JR, Luthey-Schulten Z, “Toward a Whole-Cell Model of Ribosome Biogenesis: Kinetic Modeling of SSU Assembly,” Biophys. J. 109(6):1117–1135 (2015), doi:10.1016/j.bpj.2015.07.030. Central to all life is the assembly of the ribosome: a coordinated process involving the hierarchical association of ribosomal proteins to the RNAs forming the small and large ribosomal subunits. The process is further complicated by effects arising from the intracellular heterogeneous environment and the location of ribosomal operons within the cell. We provide a simplified model of ribosome biogenesis in slow-growing Escherichia coli. Kinetic models of in vitro small-subunit reconstitution at the level of individual protein/ribosomal RNA interactions are developed for two temperature regimes. The model at low temperatures predicts the existence of a novel 5′→3′→central assembly pathway, which we investigate further using molecular dynamics. The high-temperature assembly network is incorporated into a model of in vivo ribosome biogenesis in slow-growing E. coli. The model, described in terms of reaction-diffusion master equations, contains 1336 reactions and 251 species that dynamically couple transcription and translation to ribosome assembly. We use the Lattice Microbes software package to simulate the stochastic production of mRNA, proteins, and ribosome intermediates over a full cell cycle of 120 min. The whole-cell model captures the correct growth rate of ribosomes, predicts the localization of early assembly intermediates to the nucleoid region, and reproduces the known assembly timescales for the small subunit with no modifications made to the embedded in vitro assembly network. Vafabakhsh R, Kondabagil K, Earnest T, Lee KS, Zhang Z, Dai L, Dahmen KA, Rao VB, Ha T, “Single-molecule packaging initiation in real time by a viral DNA packaging machine from bacteriophage T4,” Proc. Natl. Acad. Sci. USA 111(42):15096–15101 (2014), doi:10.1073/pnas.1407235111. Tailed bacteriophages and herpes viruses use powerful molecular machines to package their genomes into a viral capsid using ATP as fuel. Recent biophysical and structural studies have provided a detailed picture of mechanochemistry of DNA packaging. However, little is known about the packaging initiation step owing to its transient nature. Here, we reconstituted the bacteriophage T4 DNA packaging machine and imaged individual packaging events in real time. We discovered that initiations occur in bursts and through multiple pathways, including direct capture of DNA by the capsid portal, and they require rapid input of energy, analogous to the cranking of an engine. This system opens a new window into the mechanism of viral genome packaging initiation and the evolution of icosahedral viruses. Earnest TM, Roberts E, Assaf M, Dahmen K, Luthey-Schulten Z, “DNA looping increases the range of bistability in a stochastic model of the lac genetic switch,” Phys. Biol. 10(2):026002 (2013), doi: 10.1088/1478-3975/10/2/026002. Conditions and parameters affecting the range of bistability of the lac genetic switch in Escherichia coli are examined for a model which includes DNA looping interactions with the lac repressor and a lactose analogue. This stochastic gene–mRNA–protein model of the lac switch describes DNA looping using a third transcriptional state. We exploit the fast bursting dynamics of mRNA by combining a novel geometric burst extension with the finite state projection method. This limits the number of protein/mRNA states, allowing for an accelerated search of the model's parameter space. We evaluate how the addition of the third state changes the bistability properties of the model and find a critical region of parameter space where the phenotypic switching occurs in a range seen in single molecule fluorescence studies. Stochastic simulations show induction in the looping model is preceded by a rare complete dissociation of the loop followed by an immediate burst of mRNA rather than a slower build up of mRNA as in the two-state model. The overall effect of the looped state is to allow for faster switching times while at the same time further differentiating the uninduced and induced phenotypes. Furthermore, the kinetic parameters are consistent with free energies derived from thermodynamic studies suggesting that this minimal model of DNA looping could have a broader range of application. Liu C, McKinney MC, Chen YH, Earnest TM, Shi X, Lin LJ, Ishino Y, Dahmen K, Cann IKO, Ha T, “Reverse-Chaperoning Activity of an AAA+ Protein,” Biophys. J. 100(5):1344–1352 (2011), doi:10.1016/j.bpj.2011.01.057. Speed and processivity of replicative DNA polymerases can be enhanced via coupling to a sliding clamp. Due to the closed ring shape of the clamp, a clamp loader protein, belonging to the AAA+ class of ATPases, needs to open the ring-shaped clamp before loading it to DNA. Here, we developed real-time fluorescence assays to study the clamp (PCNA) and the clamp loader (RFC) from the mesophilic archaeon Methanosarcina acetivorans. Unexpectedly, we discovered that RFC can assemble a PCNA ring from monomers in solution. A motion-based DNA polymerization assay showed that the PCNA assembled by RFC is functional. This PCNA assembly activity required the ATP-bound conformation of RFC. Our work demonstrates a reverse-chaperoning activity for an AAA+ protein that can act as a template for the assembly of another protein complex. © 2018 Tyler M. Earnest, All rights reserved.